This 3" x 14" Copper Pot Still Head comes with a Liebig condenser and a commercial grade thermometer with a 3 face. The condenser is detachable and can handle anything that you throw at it. This listing is for the column only, the boiler is not included. Designed with solid TIG welded construction, which is much stronger than soldering or brazing. All of our copper heads and columns are TIG welded using food grade DHP copper welding rod. This means that the welds are as strong or stronger than the surrounding metal. This DHP copper rod melts at around 1,700° F, while the solder that our competitors use melts at around 400°F. Solder joints are not nearly as strong as our welds, plus solder is messy, runs and gets all over the metal, while our welds are tight, clean and pretty. Commercial grade thermometer with a 3 face. 3 Tri Clamp stainless ferrule connection welded to the base of the column for connecting to a still. 3 Tri Clamp with gasket for connecting head to still. 28.5" long Liebig condenser with 1/2" inner tube and 3/4 outer tube. 3/4 Copper union for connecting the Liebig condenser to the column. 5/8 OD hose barb connections on the condenser for cooling. Super heavy duty construction using copper welding rod and heavy gauge copper. This still comes with a book titled "Moonshine" by Matthew B. This book is packed full of information and is very entertaining. It traces the history of making moonshine from the pioneer origins, through prohibition to today's libations. 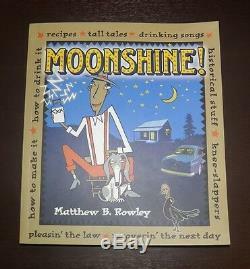 This book contains recipes along with drinking songs and even offers insight on how to drink moonshine and recover the next day. Chapter's include: Equipment; Ingredients; The Process; Fundamentals of Distilling; Operating a Pot Still; Whiskeys: Grain-Based Recipes; Rums and Washes: Sugar Based Recipes; Now That You've Made It: Moonshine-Based Recipes. This Pot Still Column is built to last a lifetime. Pass it down to future generations. These products may not be legal to operate in some areas. Affordable Distillery Equipment, LLC strongly discourages any unlawful use of these products and is not responsible for any damage or injury caused by the misuse or unlawful use of these products. Any person or entity that uses information or equipment provided by Affordable Distillery Equipment, LLC does so entirely at their own risk and accepts all liability concerning the use of the aforementioned equipment and information. The item "3 Copper Pot Still Column & Built in Condenser, Whiskey, Moonshine Head, withbook" is in sale since Friday, April 18, 2014. This item is in the category "Home & Garden\Food & Beverages\Beer & Wine Making". The seller is "affordable-distilling" and is located in Doniphan, Missouri. This item can be shipped to United States, Canada, United Kingdom, Denmark, Romania, Slovakia, Bulgaria, Czech republic, Finland, Hungary, Latvia, Lithuania, Malta, Estonia, Australia, Greece, Portugal, Cyprus, Slovenia, Japan, China, Sweden, South Korea, Indonesia, Taiwan, South africa, Thailand, Belgium, France, Hong Kong, Ireland, Netherlands, Poland, Spain, Italy, Germany, Austria, Israel, Mexico, New Zealand, Philippines, Singapore, Saudi arabia, Ukraine, United arab emirates, Qatar, Kuwait, Bahrain, Croatia, Malaysia, Brazil, Chile, Colombia, Costa rica, Panama, Trinidad and tobago, Guatemala, Honduras, Jamaica, Bahamas, Viet nam, Uruguay, Switzerland, Norway, Antigua and barbuda, Aruba, Belize, Grenada, Saint kitts and nevis, Saint lucia, Barbados, Bangladesh, Bermuda, Bolivia, Ecuador, Iceland, Jordan, Cambodia, Cayman islands, Liechtenstein, Sri lanka, Luxembourg, Macao, Martinique, Maldives, Nicaragua, Oman, Peru, Pakistan, Paraguay, Reunion.